Our professional philosophy is a balance of results and relaxation using a variety of cutting edge, effective, and efficient treatments tailored specifically for your skincare goals and lifestyle. All Bloom facials include a skin analysis, double cleansing, steam, exfoliation, a luxurious neck, shoulder and declote massage, and extractions if necessary. 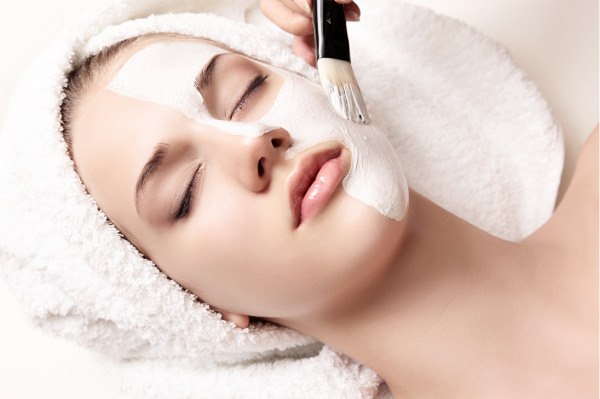 Some of our facials also require toning, peels and a masque depending on your skins needs. Just looking for thoughtful maintenance? We will work with you and your specific needs to develop the right combination of treatment, product and daily routine that will truly change the way you look and feel. An individualized treatment designed for troubled, problem skin of teenagers. Skin that may bt suffering from hormonal changes and acne is left feeling refreshed through gentle deep-cleansing methods and exfoliation. Restore the balance and natural beauty of your skin. A highly therapeutic aromatherapy facial custom designed for any skin type. Our deep-cleansing, hydrating facial uses steam and a specialty masque designed for your skin's unique needs. This facial leaves your skin soft and subtle, designed to soften and remove accumulated dead cells. A facial custom designed for blemish, acneic prone skin and aging skin. Treatment is ideal for clogged, congested, breakout-prone skin. Includes skin assessment, deep pore cleansing, and enzyme exfoliation. With proper home care products reduction and clearing of acne can be achieved. Hydration and Protection. Skin is left radiant and refreshed. Wrinkles and fine lines don't stand a chance with this signature age-defying treatment. Especially good for sun damaged, aging and acne prone skin. We use pumpkin acids which carry over 200 nutrients to exfoliate dead skin and nourish the new skin below. Pumpkin extracts act as a rapid yet gentle exfolient, remove dead cells, reversing damage caused by the sun. Skin becomes clearer, smoother, more vibrant. Peels are customzed to your skin type. Professionally applied peel solutions exfoliate dead skin cells and help healthy skin cells rise to the surface. These treatments allow deeper layers of fresh and untouched skin to be revealed. The result of monthly treatments can even skin tone, clear acne, improve the appearance of aging skin and make dull complexions glow.